Some Conservative MPs are to join the SNP in demanding a debate on postponing disability benefit cuts. They will jointly call for a debate on plans to cut Employment and Support Allowance payments for sick and disabled people by £29 a week. One MP said there could be an attempt to force the government to concede at next year's Budget. The Department for Work and Pensions said savings would be reinvested in a new package of support. 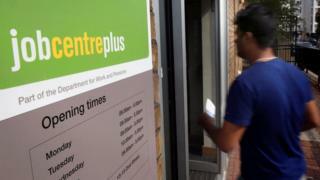 Employment and Support Allowance (ESA) payments for those deemed well enough to prepare for work are to be cut to £73 a week, the same level as the Jobseeker's Allowance from next April. Conservative MP David Burrowes told BBC Radio 4's Today programme "tens" of Conservatives had concerns. He said he could try to amend the chancellor's Finance Bill that will follow next year's Budget if he was not happy. He said there was "huge public concern" and he wanted to see extra staff and cash for those hit by the cuts, which will only apply to new claimants in the ESA work-related activity group. "I want to see by the time we get to the Budget next year we have delivered for these most vulnerable people, otherwise we have finance bills, we have opportunities in terms of legislation to be able to put forward amendments and make sure we deliver for these people," Mr Burrowes said. The SNP's Neil Gray is to apply for a debate at the House of Commons backbench business committee. His motion calls for the cuts to be postponed until alternative support is put in place. The debate would not force the government to change its policy but would provide an opportunity for critics to air their concerns. Mr Gray said: "I hope the debate can be heard ahead of the Autumn Statement. It will be an opportunity for the government to listen to MPs from across the chamber and to the organisations representing sick and disabled people who want to see these cuts halted." Ministers announced draft plans for extra support for people affected by the cut - known as the work-related activity group - but worried Conservatives say they will not be content unless staff and funding is promised to help sick and disabled people. Other Tories backing the call for the debate include Jeremy Lefroy, Stephen McPartland and Heidi Allen. Labour, Liberal Democrat, Plaid Cymru, SDLP, UUP, DUP and Green MPs are also supporting the debate. A DWP spokesman said: "To ensure people have the best practical support possible, we have re-invested these funds to form part of the new Personal Support Package, which includes support for ESA and Universal Credit claimants with limited capability for work. "The system was in need of reform as it trapped many disabled people on welfare and failed to provide the right incentives and support to help people into work, with only one in 100 claimants moving out of the work-related activity group and into work each month."